Director – Gino Nichele, Screenplay – Elana Lasser & Cliff Ruby, Producers – Shelley Dvi-Vardhana & Jennifer Twiner McCarron, Music/Songs – Arnie Roth, Animation Directors – Colin Adams, Oscar Lo & Colin Oleksyn, Production Design – Walter P. Martishius. Production Company – Mattel Entertainment/Rainmaker Entertainment. Barbie and her best friend Teresa are having a sing-along when young Stacie comes in, upset that she has had a falling out with her friend Courtney. To console Stacie, Barbie tells her a story about best friends falling out. Best friends Liana and Alexa lived together in a cottage in the woods but were poor. One day, they offered what food they had to an old woman who asked them to choose from some of her junk in return. Liana took a mirror and when cleaned this revealed another girl trapped inside. She introduced herself as Melody and told how she used to be an apprentice muse until the evil Lydia petrified all the other muses and took over. Melody has hidden inside the mirror because she holds the secret of the way to the muse’s castle where a new diamond is added every time someone creates a song. Melody’s singing now alerts Lydia to her whereabouts and she sends her flying lizard Slyder to capture Melody. Fleeing with the mirror, Liana and Alexa try to find their way to the diamond castle. Howvere, Lydia seeks to use her evil powers to tear their friendship apart. 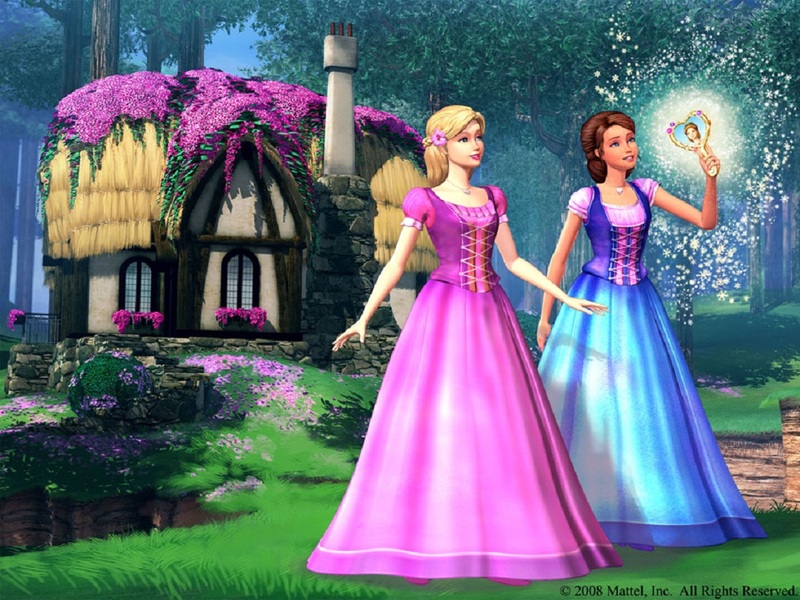 Barbie & the Diamond Castle was the twelfth of the animated films based on Mattel’s best-selling girl’s doll from Canadian computer animation firm Mainframe Entertainment (later to become Rainmaker Entertainment). Others of these include Barbie in the Nutcracker (2001), Barbie as Rapunzel (2002), Barbie of Swan Lake (2003), Barbie as The Princess and the Pauper (2004), Barbie Fairytopia (2004), Barbie and the Magic of the Pegasus in 3D (2005), Barbie in The 12 Dancing Princesses (2006), Barbie Mermaidia (2006), Barbie as The Island Princess (2007), Barbie Fairytopia: Magic of the Rainbow (2007), Barbie in A Christmas Carol (2008), Barbie Mariposa (2008), Barbie and the Three Musketeers (2009), Barbie Presents Thumbelina (2009), Barbie: A Fashion Fairytale (2010), Barbie in a Mermaid Tale (2010), Barbie: A Perfect Christmas (2011), Barbie: A Fairy Secret (2011), Barbie: Princess Charm School (2011), Barbie in a Mermaid Tale 2 (2012), Barbie: The Princess & The Popstar (2012), Barbie and Her Sisters in a Pony Tale (2013), Barbie in The Pink Shoes (2013), Barbie Mariposa and the Fairy Princess (2013), Barbie and the Secret Door (2014), Barbie: The Pearl Princess (2014), Barbie and Her Sisters in the Great Puppy Adventure (2015), Barbie in Princess Power (2015), Barbie in Rock’n’Royals (2015), Barbie and Her Sisters in a Puppy Chase (2016), Barbie Spy Squad (2016), Barbie Star Light Adventures (2016), Barbie: Dolphin Magic (2017) and Barbie: Video Game Hero (2017). The Barbie series has become a lucrative one for Mainframe/Rainmaker – Barbie & the Diamond Castle was no less than one of five Barbie films they put out in 2007-8 alone. One distinctive aspect of Mainframe/Rainmaker’s Barbie films is always their flat visual style. In the early efforts, the stories felt as though they were generated by formula, while the animation made the characters flat and glassy. The later efforts from around 2004 onwards put a huge amount of effort into crafting an incredibly vibrant palette of colours, seemingly as though determined to use the full spectrum in every scene. It is possible to run all the Barbie films alongside one another chronologically and see the advance of Mainframe’s animation skill with each one. By the time of Barbie & the Diamond Castle, the quality of Rainmaker’s animation has become dazzling. The opening shot is a pan around Barbie’s apartment with her and her friend playing guitar that comes with a depth that it almost puts one right into the frame. Mainframe/Rainmaker have also invested a good deal into the 3D architecture with the girl’s cottage, Lydia’s cave and the diamond castle itself all having solidity like one could move around inside and look at the floor plans. (The sole exception being the visit to the village where the buildings look flat and hold no internal depth to them, exactly as though they were obviously painted backgrounds in a live-action film). While Mainframe/Rainmaker’s quality of animation makes vast strides with each film, there has been no corresponding improvement in the stories. With Barbie & the Diamond Castle, they have made a big effort to bring the characters to life – the two girls joke and banter with one another as though modern teenage girls and there is a degree of humour in the writing of their dialogue. On the minus side, the dragon Slyder looks too cute to be threatening and is voiced in a way that makes him sound like a moron. However, the result is a cut above the rest of Mainframe/Rainmaker’s Barbie films in its sense of humour, characters and visual depth – it is the first of these films that does not feel like it is formula. Mainframe/Rainmaker reintroduce songs with The Diamond Castle – each of these comes delivered with a technical proficiency but little in the way of genuine feeling. There is an interesting idea to the film that music is a form of magic that has its own power (this is clearly a film written by musicians and/or music lovers). The underlying message the film pushes is of best friends remaining loyal through everything, which it lays on with a trowel.